With two games to go in the Month of Champions, Connacht Rugby want to celebrate champions all across the province. 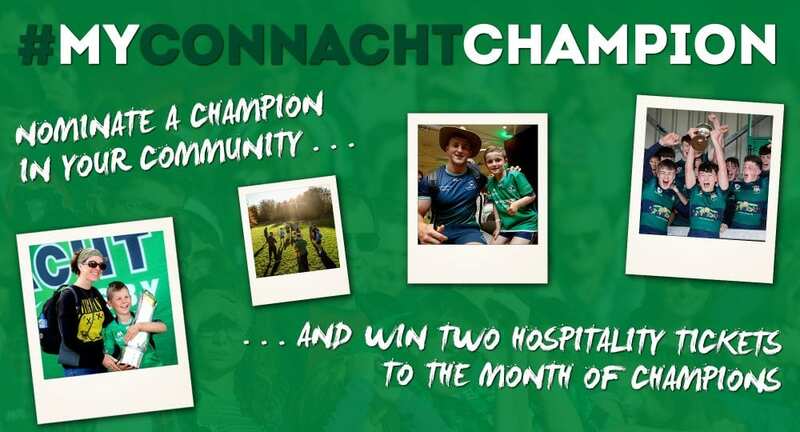 That’s why we’re introducing #MyConnachtChampion, which showcases the champions in communities across Connacht and gives you the chance to win some special tickets to our remaining Month of Champions games. Champions are not just the rugby players on the field. They can be anywhere in the West of Ireland. They’re the people who volunteer with their local club or group, or the parents who spend their nights bringing their kids to training or rehearsals. They are the people who are striving to make the lives of others better, and deserve the recognition as a result. Fancy winning two Hospitality Tickets to our #MonthOfChampions games with Scarlets or Leinster? Introducing #MyConnachtChampion: a showcase of champions in communities across the province. Send Connacht Rugby your nomination on Facebook, Twitter or Instagram by tagging them using @ConnachtRugby and the hashtag #MyConnachtChampion. Tell a bit about the person you’d like to nominate and why they’re a champion in your eyes. If you have a photo or video of your nominee send it in too. The two winning entries, chosen by their judges, will receive two Hospitality Tickets for either the Guinness PRO14 meeting with Scarlets on Saturday 22nd September 2018, or the interprovincial derby with Leinster on Saturday 29th September 2018. These hospitality packages include pre-match food in the Heineken Clubhouse, live pre-match entertainment, match tickets and post-game meet and greet with some of the players. Your winning entry will also be showcased on the big screen at half-time of the game. You can enter at any time! The winner of the Scarlets tickets will be announced on Thursday 20th September on Connacht Rugby’s social media, while the Leinster ticket winners will be announced a week later, on Thursday 26th September. All nominations submitted prior to the Scarlets game will also automatically be included in selection for the Leinster tickets.